Evelyn Bell Walker Holcombe entered the arms of her Heavenly Father on January 28, 2019 in Largo, Florida at the age of 93. Evelyn was born on September 5, 1925 in Oakvale, Mississippi to Rev. R. R. Walker and Leedie Stewart Walker. She was an inspiration to all and loved unconditionally everyone she met. Evelyn’s ministry on the piano and organ encompassed numerous churches throughout the southeast from an early age even up to her passing. She currently ministered each Sunday at First Baptist Church of Indian Rocks and Seminole Community Church in Largo, Florida. 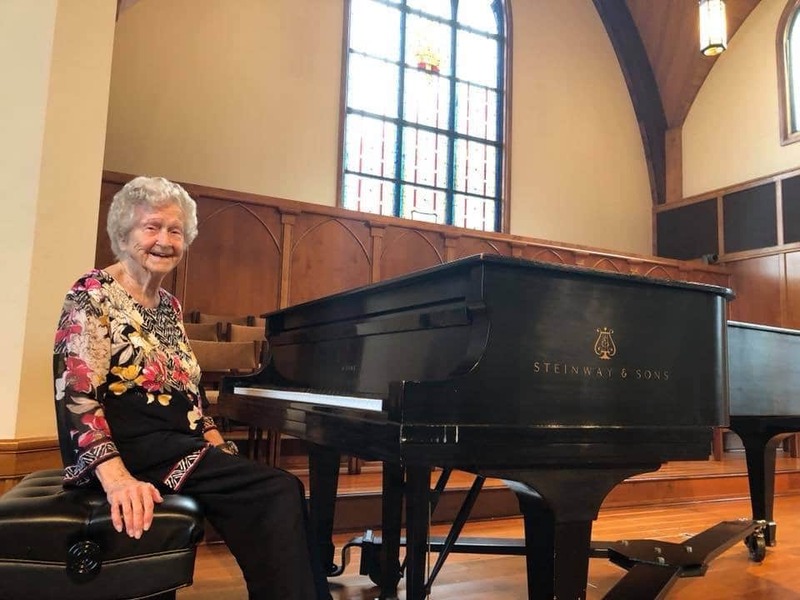 She taught hundreds of piano students over her lifetime and continued this passion until her home going. Evelyn was preceded in death by her parents Rev. and Mrs. R R. Walker, her husband, Lavant Holcombe, her daughter and son-in-law, Dianne Mitchell and Dr. Spencer Mitchell of Florida, a brother (little)Rufus Royd Walker, sister and brother- in- law, Marie and Clyde Caraway, Nashville, Tennessee, brother and sister-in-law, William Ralph and Bertha Walker, Cleveland, Tennessee; and brother Kenneth R. Walker, Memphis, Tennessee. She is survived by her beloved grandson and faithful care giver, Bryan Mitchell, son and daughter-in-law, David and Linda Holcombe; grandchildren Bryan, Kenneth, Anton, Chelsea and Keely, great grandchildren, sister-in-law Wanda Walker, a host of nieces and nephews and many devoted friends who loved and cared for her. Evelyn was recently honored at Lee University, Cleveland, Tennessee; Centennial Celebration event as Lee University’s oldest living student. She studied piano at Lee when her father, R.R. Walker, was President of the Bible Training School. A celebration of Evelyn’s home going will be held Sunday, February 3rd at 2:30 at First Baptist Church of Indian Rocks in Largo, Florida. Evelyn’s life exemplified a love for her Lord, her family and others. She will be greatly missed but will remain in our hearts forever. Evelyn was an amazing, dear, talented, Godly lady! She had keen ears to hear the word and instruct students at HTCS. She left a mark on all the students including me. It was as if the walls had ears when Evelyn was in the building. She had a heart for the Students. She will not be forgotten! There will be much rejoicing when we all get to heaven! Brian you and the family are in our prayers! We are sorry to miss this wonderful homegoing! It is wonderful to know she is wrapped in the arms of our Savior! I was one of her many piano students at the home, when I thought I was nothing she loved me through all the lessons, and gave me encouragement. I have been playing the piano in church for forty years, and everytime I play I give God all the glory and thank Him continually in my heart for allowing Sister Holcomb to believe in my small talent. How can you ever forget someone who was so precious as she was and I know some day I will see her again. Praise God! My heart goes out to Evelyn / grandma’s family and we have truly been Blessed to have known her.Bryan, know that you have a great support system around you so don’t hesitate for our help.I wrap my arms around you in love and prayers…God Bless. May God bless this family as they deal with the loss of their beloved love one. She is in heaven now and with all the saints, the Lord and His Heavenly Hosts and all our loved ones that have gone on before us. We will see our sister again one day. Until then, enjoy heaven sweet Evelyn. Saddened to hear of the passing of Sis. Holcombe. She was such a wonderful lady. She was so precious,so kind and will never be forgotten. Trust the Lord will continue to bring peace and comfort to the family.